Each of my patterns is read, tested, and edited multiple times, but occasionally an error slips through. Errors are fixed immediately in any future printings and corrections are posted here. If you find any errors, please contact me. Thank you! To the Point #141: The pattern is correct but the images are misleading in steps 8, 16, and 18. 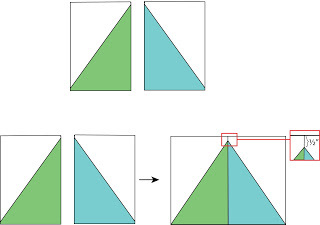 In steps 8 and 16, the half rectangles should have 1/8″ or slightly more extra white fabric at one corner, and extra print fabric at the other corner. When sewn together into the triangle, this makes the extra 1/2″ seam allowance at the point of the triangle. Button Up #142: The pattern is correct, but I recommend cutting each fat quarter very very carefully! 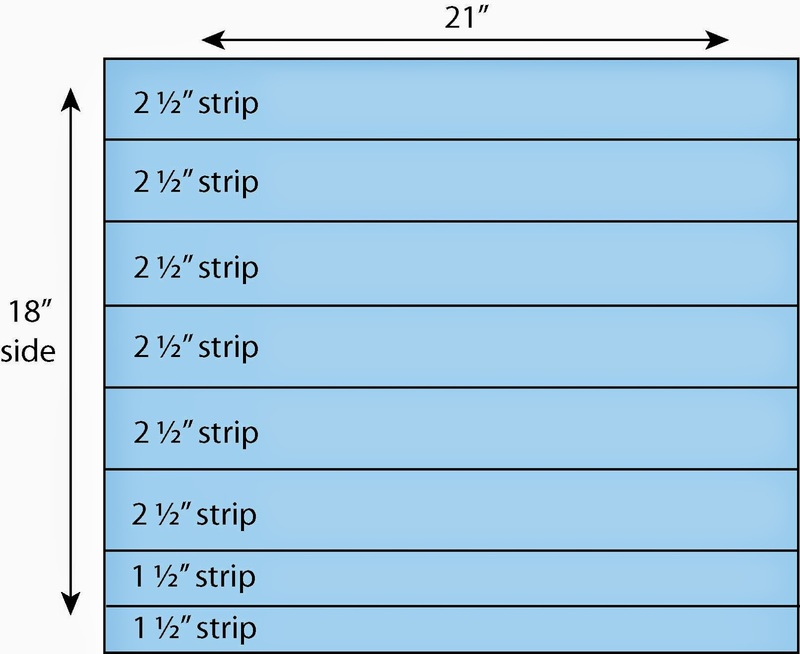 The pattern uses the entire 18″ length of each fat quarter as you can see in the diagram below…you may not have room to square up the edge of each fat quarter before cutting. Lay each fat quarter on the cutting mat and plan out your cuts before cutting, making sure that you will have enough length to make each cut before trimming up the edges at all. If you pre-wash and dry your fabrics, you may not have enough length to use and will need to use additional yardage to cut the pieces from. Touchdown #143: The pattern is correct, but I recommend buying 1/2 yard of each background fabric, especially if you are a beginner. It will give you some extra room for mis-cuts. Off Track #121: The pattern is correct but if you are making a KING size, I would recommend adding another one to two blocks onto each row to make the quilt wider. Email me at cluckclucksew@gmail.com if you want to make the KING size and I can help you adjust the requirements!